The UCF football team did not disappoint in the first game of the Josh Heupel era. 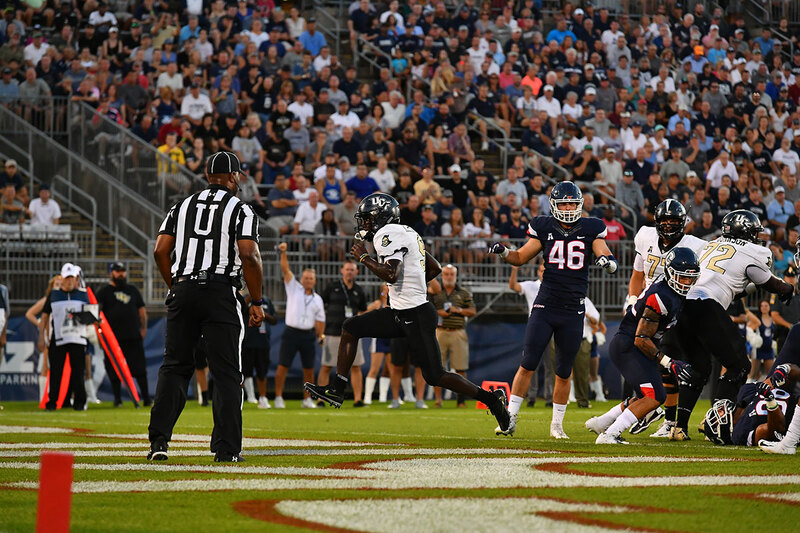 The Knights racked up 652 yards of total offense, the defense came away with three turnovers, and UCF laid a 56-17 beatdown on UConn in its season opener Thursday night on the road. The Knights extended their nation-leading winning streak to 14 games and will look to keep momentum rolling as they return home for a 6 p.m. matchup against South Carolina State on Sept. 8 at Spectrum Stadium. Quarterback McKenzie Milton got his #HIsman campaign off to a solid start, throwing for 346 yards and five touchdowns. It was the ninth 300-yard passing game of Milton’s career and the fifth time he’s thrown for four touchdowns or more. The junior was recognized for his effort Monday when he was named the American Athletic Conference’s Offensive Player of the Week. It marks the fifth career Player of the Week nod for Milton, who earned four throughout last season. The offense defined efficiency, scoring in 2 minutes, 39 seconds or less on each of its scoring drives. The Knights put points on the scoreboard on 8-of-9 offensive possessions (not including running the clock out at the end of each half). The Knights steadily logged 14 points in each quarter. Thanks to the win, the Knights moved up in the national polls, ranking No. 19 in the AP Top 25 and No. 20 in the latest Amway Coaches Poll. UCF is currently the highest ranked program from the state of Florida. This fan guide to the 2018 season — which offers details on parking, tickets, tailgating and more — is a must read before heading to Spectrum Stadium on Saturday.